If you want to get the most out of your fonts, then PopChar is the right tool for you. 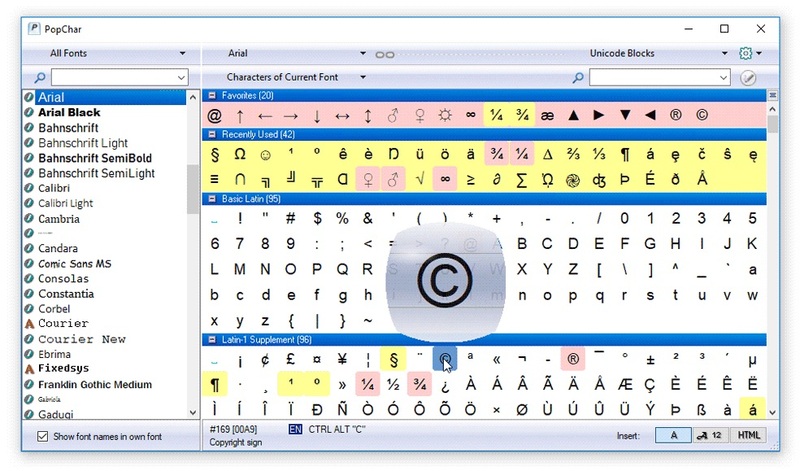 Most of your fonts contain thousands of characters, many more than you can access from the keyboard. PopChar makes "typing" of unusual characters easy without having to remember keyboard combinations. Whenever you need a special character, PopChar is there to help. Click the "P" in the menu bar to display a table of characters. Select the desired character and it instantly appears in your document. PopChar works with all modern applications that support Unicode. It makes it easy to navigate and search within fonts that contain thousands of characters. Search for characters by their names, find fonts that contain certain characters, explore the character set of fonts, collect your favorite characters, insert HTML symbols. PopChar makes all these font-related tasks easy. You can even take a new look at fonts from a designer's perspective – see font previews, check out what a given text fragment looks like in a certain font, and much more. You may distribute exact copies of the evaluation version of the software through electronic or other channels. You are specifically prohibited from charging, or requesting donations, for any copies, however made. Distribution of registered versions, license keys, or individual files from the archive is strictly prohibited. Ergonis Software reserves the right to revoke the above rights at any time, for any or no reason. If you have any questions, please contact us at office@ergonis.com. Ergonis Software grants the customer a non-exclusive and non-transferable license to use the “software” as long as the customer complies with the terms of this agreement. With a single-user license, you (the customer) may use two copies of the software on two computers that are owned by you. A multi-computer license may be purchased to allow the software to be used on more than two computers.